Cheating is forbidden? Not in this naughty game of cards - in fact, you'll probably have to cheat in order to win. 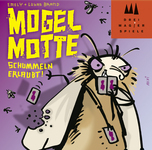 In Mogel Motte you want to get rid of all the cards in your hand before anyone else. Each player starts the round with a hand of eight cards, with one player (the oldest) receiving the guard bug - which stays on the table throughout the game - and one card being turnd face-up to start a discard pile. The cards are numbered 1-5, with the majority of them having only numbers; some cards have special abilities that come into play when added to the discard pile or in a player's hand. There's another way to rid yourself of cards, though: cheating! Throughout the round, you can make cards disappear by dropping them on the floor, hiding them up your sleeve and so on. You must keep your hand of cards above the table at all times, you can't vanish more than one card at once, and you can't rid yourself of your final card this way. The player with the guard bug - and only him! - can call out other players for cheating, and no one can cheat while the accusation is being resolved. If the accusation was false, the Guard must draw a card; otherwise the cheating player takes back the card she tried to lose, is given a card from the Guard's hand as additional punishment, and becomes the new Guard. Ant: After an ant is played, everyone but the active player must take a card from the discard pile.